AMSG Ashokan devotes considerable time to the AIFMP activities, as well as mentoring his multiple businesses in Sivakasi. Linking all the associations throughout the country, combatting with GST authorities on levy of unreasonable tax rates; and creating a to-do attitude about his pet projects like NAEP Awards, Pamex and Romancing Print, the Federation is abuzz. 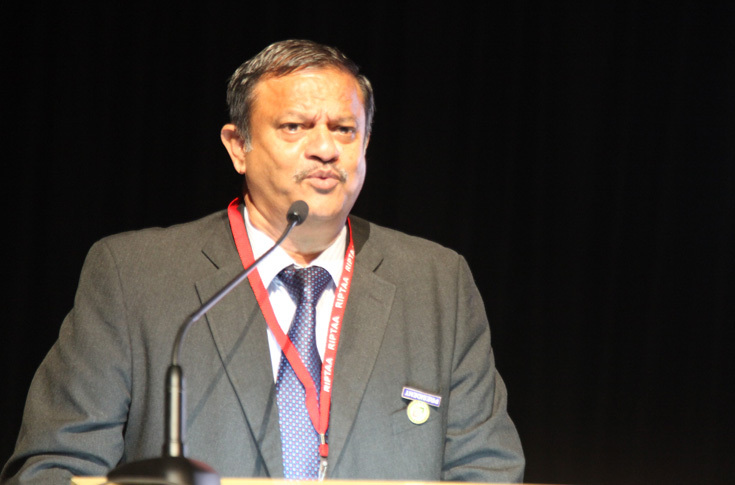 Ashokan: "At present, there are 2.5-lakh registered members in our federation, out of which two-lakh members comes under MSME"
PrintWeek India (PWI): What has been the high point of your tenure as the president of AIFMP? AMSG Ashokan: It’s my second term as the president. During my first term, my focus was on infrastructure development of the printing industry. Now I have concentrated on the promotion of the printing industry by linking all the affiliates throughout the country and in strengthening the financial position of the association. PWI: You are a second generation industrial family in Sivakasi. How did the print business come into play? Ashokan: Yes, ours is a consortium manufacturing, matches, fireworks, and aluminium powder. In 1967 my father felt that there is much demand for the printing and packaging materials to support our consortium. He entered into printing in 1967. I joined the business in 1984 and took care of the printing and packaging business in addition to my family business. PWI: What are the challenges for the industry and specifically for AIFMP members right now? Ashokan: For one, the world is moving towards digital, which is impacting print. Lots of things that were earlier printed are moving online. It has made print volumes smaller, with print on demand even for one copy. This has digital printing into focus. Unfortunately, digital printing has not reached every nook and corner of our country. Our printers are also significantly impacted by the fluctuating raw material prices. How are you addressing the rising prices? Ashokan: Printers have long felt the need for an accurate and credible mechanism for tracking the costs of key raw materials which will help them present a fair and precise idea of the cost. Such a mechanism would deliver much-needed transparency in the price of the raw material. I think the solution lies in moving towards a periodical contract for the supply of raw material at a fixed price. PWI: How has the feedback been for the price index template along with Crisil? Ashokan: The two indices – PRIDEX and CARDEX are assisting printers to assess change in overall cost related to printing activities. It’s helping make informed economic decisions. The customer is also aware of our input costs. PWI: Mr Ashokan: You are associated with so many industries. One thing print can learn from those industries? Ashokan: Printing is a capital-intensive industry whereas fireworks and matches are not so. With a four-colour printing machine, a printer can earn a decent income. At present, there are 2.5-lakh registered members in our federation, out of which two-lakh members come under MSME (micro, small and medium enterprises). These two-lakh units still exist as a supporting industry. We have to educate the members of these units to get to the next level of operations. PWI: What is your dream project at AIFMP which you hope should continue? Ashokan: There are three – NAEP, Pamex and Romancing Print. The NAEP filled the void created by the Directorate of Audio-Visual Publicity (DAVP) that discontinued its printing awards programme in 1983. We are reaching out to printers to make them quality conscious through this programme. PWI: Moving Pamex to Mumbai was a right decision? Ashokan: Yes, Pamex in 2013 in New Delhi was a disaster. We moved it to Mumbai in 2015 where we saw its potential. Pamex 2017 witnessed the exhibitors book a record-breaking 8,600 sqm. This shows how Pamex has gained momentum and attracted many exhibitors over a period. To remind you, Pamex is the only exhibition which is organised by the printers for the printers. PWI: Romancing Print has now become a roadshow? Ashokan: Romancing Print, the name itself is attractive, isn’t it? Yes indeed, this method is to educate printers from unorganised sectors. This will make them understand the government rules and regulations with respect to the printing industry, gain awareness about the innovation in the industry and modern types of machinery, and to streamline their activities. This year 400 members from each zone, totalling to 2,000 members from across the zones have attended the meeting. PWI: You have travelled across the country, what are you seeing? Ashokan: I have been invited to all the regions. I have seen print houses with 40 years of traditional printing. I have seen more young entrepreneurs take charge of their family print business. The commercial printing industry is being redefined by what some might call the digital, communications or information revolution. It’s not affecting all the printers in the same way, but it will eventually catch up with everyone. The growth of this industry in India is 7.5% annually. PWI: Your comrade in arms was Arvind Mardikar, whose contact with the ministers in the BJP and RSS rank and file is huge. What were the benefits? Ashokan: Arvind has been liaisoning with the central government. His contribution in streamlining the GST for the printing industry is commendable. During this year we have met the government authorities on various issues, which include rationalisation of GST rates for boxes and cartons made out of non-corrugated boxes and paperboard in line with applicable GST rate of 12% on corrugated boxes; exemption from customs duty on import of printed materials and case of inverted duty structure; classification of printed products under HSN codes instead of SAC codes; anti-dumping investigation against imports of coated paper from USA, Peoples Republic of China and European countries; enhancing the MEIS benefit from the existing 2% - 3% to 5% on export of printed materials from India; and suggestion to give significant boost to export printed materials from India. Arvind’s tenure as honorary general secretary is for one year. But the yeomen service he has rendered for the printers in our country will go through the annals of the history of the printing industry and will remain forever. We are thankful to him. PWI: Spare parts pricing and ensuring parts and labour prices are kept competitive is a crucial part of the business; along with maintenance costs. Any AIFMP plan on these issues? Ashokan: We are encouraging Indian manufacturers to manufacture the spare parts with international quality indigenously. PWI: Will we see campaigns like the one the PAPER DAY campaign the FPTA unleashed on 1 August in attempt to create awareness about paper?Ashokan: Good question. I’ll think over it and discuss with my fellow committee members. PWI: And finally any rehab plan for the print industry in Kerala? Ashokan: AIFMP is always generous in its charity work. All the affiliates are donating individually for the cause of the people in Kerala. AIFMP is also providing human resources and financial assistance in machine maintenance. One print kit which you think is ideal for India? One major myth about our industry? What is your favourite print phrase or mantra? Proud to be a printer. What is your favourite print city (other than Sivakasi) in India? One big plan that Sivakasi fireworks industry has for this festival season? To produce fancy products that will compete with Chinese counterparts. One thing about print in Sivakasi no one knows like the print cluster program? Diploma courses in printing being offered at two institutions. It very rare find two print training institutions in one city in the country. What is the worst example of quality print according to you? Use of cheap raw material for printing. What advice would you give to the next president? Strive hard and raise the standard of the industry. How would you like your tenure to be remembered?